Some people dress up their pets and they just look ... miserable. But then there are some that just blow you out of the water. This is Toby. Toby is a little Maltese who can rock glasses, a hat and a bow-tie better than you ever could -- and he knows it. 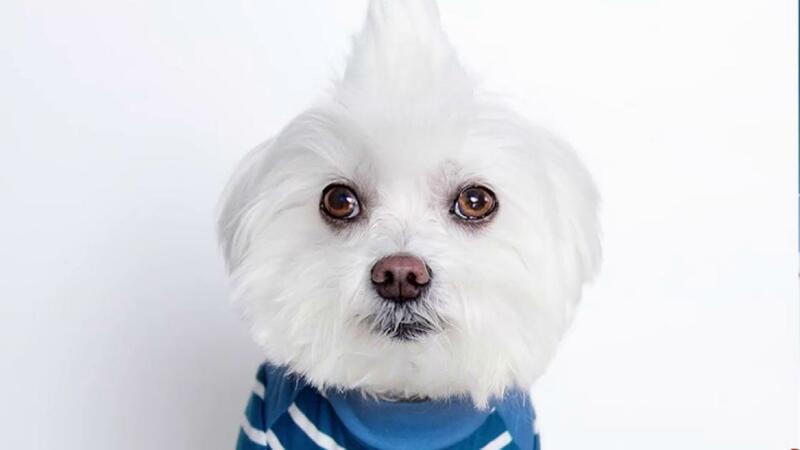 This fashionable ball of fur is a "hipster dude with attitude," and we just can't get enough. Toby's owner, Joyce Chen, told ABC news that his "modeling" career began by chance. "I put my sunglasses on Toby one day and noticed that he didn't mind them ... I snapped a photo and shared it online and people seemed to love it," she explained. Toby's impeccably coiffed and sometimes ventures into edgier looks. But like all of us, sometimes there are just those days ... we feel ya buddy. I'm taking a hot shower. It's like a normal shower but with me in it. Then the next day he's back at it again, making us melt with his killer looks. No wonder he has more than 100,000 followers on Instagram. Hey, you're pretty and I'm cute. Together we'd be Pretty Cute! The only exercise I've done this month is running out of money. The older you get, the more you appreciate being home doing nothing. When bae says she wants to talk. Currently seeking a queen to call my own. I might as well Google you because you have everything I'm looking for. I'm in a serious relationship with my Wi-Fi. We have a strong connection. When you have a rose but no bae to give it to. #SpringSniffN. 45 Prizes. 45 Winners. Plus a 195K Shoutout! The most extravagant prize giveaway Instagram has ever seen! PRIZES: US/Canada (26 prizes) + 195K shoutout 10 @ThePetKeeper Interactive Storage System 3 @WhistleLabs Activity Monitor 2 @ShopDapperDogs $50 Gift Certificate 1 @WolfGangManAndBeast 2 Collars + 2 Leashes 3 @Frenchie_Bulldog 1 Harness + 1 Collar + 1 Leash 1 @LazyBonezz 1 Collar 1 @NorthernBiscuit Biscuits + Soft Treats + BARK! Chews + BIG Biscuits 1 @EarthRated 4-Month Supply Poop Bags + 2 Dispensers + Swag 1 @PrideBites $25 Gift Certificate 3 @BarkBox (1 month) International (6 prizes) + 195K shoutout 1 @BarkBox (12 month subscription) 3 @BowTiesByOtis 2 Bow Ties 1 @NaturalDogCompany 1 Pawsoother + 1 Snout Soother + 1 Pawtector + Feature 1 @ArmTheAnimals 1 Shirt + 1 Bandana + 1 Collar + 1 Leash Europe (12 prizes) + 195K shoutout 12 @KyonNaturalDogFood Biscuits UK (1 prize) + 195K shoutout 1 @DougAndBone £30 Gift Certificate PRIZE DISTRIBUTION: 1st, 2nd and 3rd place winners get to select a prize of their choice (subject to shipping availability as listed above). All other winners will have a prize selected on their behalf. RULES: 1. Follow all hosts: @toby_littledude @michcant @operation_sumo @bellalovesbeau @otisthebluefrenchie 2. Post a Spring themed photo and in the main caption mention: “This is my entry for the #SpringSniffN contest hosted by @toby_littledude @michcant @operation_sumo @bellalovesbeau @otisthebluefrenchie. I’m from (insert country here)”. 3. Public accounts only. 4. Three entries per account. Only entries posted between April 14th - April 27th, 2015 are eligible. 5. Contest ends Monday, April 27th midnight PST. Winners announced Thursday, April 30th. I posted bail just in time to announce the 3 winners of my #TobysStPatricksGiveaway! Congratulations to @thestinkymimi, @stereocavalier & @sashathesnowprincess! You have each won a $50 online gift card to shop at @shopdapperdogs! [www.shopdapperdogs.com] Winners will be contacted via DM shortly. Thank you to everyone who entered. There were so many awesome photos. Hang on to your leashes... as there's a HUGE contest coming soon... Like really HUGE. Like GINORMOUS.